CPS Medical understands your expectations. You expect quality home medical equipment at a fair price, with fast, friendly service. We have provided this in medical equipment services for over two decades. CPS Medical stands ready to serve your medical equipment needs. A selection of Oxygen systems to meet your individual needs. Be it an Oxygen Concentrator, Liquid System, Gas Cylinder or Conserving Device. Home Medical Equipment includes Hospital Beds, Mattresses, Suction, Wheelchairs, Walkers, and more. Bariatric 300+ lb. capacity available. Accessory and Supply needs for most types of Home Care needs. A full range of Respiratory Therapy Equipment - Oxygen, Nebulizer/Aerosol, CPAP/BiPAP, Peak Flowmeter, Ventilator/IPPB. Full-Time 24 Hour Support by Licensed Respiratory Therapists. Authorized, factory trained Technicians to meet your service and repair needs. When you need help with your equipment, we have people here to help you. A Nationwide referral/care system - Freedom Link - which allows individuals using medical equipment to travel with confidence. Experienced, Local Billing Department to make the most of your insurance and third party coverage. Excellent coverage of the East Texas Area. 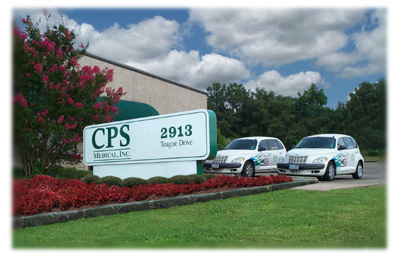 CPS Medical is committed to Compassionate, Professional Service. Thank you for the opportunity to serve your needs.